Accelerate your movement to the Google Cloud through automated cloud security. Deliver consistent security protection on-premise, in the private cloud, and public cloud. Reduce cloud security costs 40-60% while reducing security risk. Automating and Simplifying Rackspace Cloud Security compliance. Raxak Protect enables enterprises to reduce cloud security costs 40-60%, decrease security risk, and maintain compliance with industry standards (PCI-DSS, HIPAA, FFIEC, FISMA). Only a handful of companies have successfully leveraged the cloud to transform their businesses by making their processes more flexible and agile while also reducing their IT costs. Forrester’s research shows that leveraging the cloud is difficult because of the cost and complexity security compliance. Regulated industries like financial services (FFIEC), retail (PCI-DSS), and healthcare (HIPAA) have to show their auditors that they are compliant with government and industry standards. Forrester’s recommendation is that automation is the only way to cost effectively deliver consistent security compliance on-premise and in the cloud. Otherwise, security compliance costs will significantly reduce the cost benefits of using the cloud. Cloud Raxak, Gartner Cool Vendor in IT Automation, will lead a panel discussion on how intelligent automation is enabling regulated industries like financial services to leverage the cloud, while effectively managing risk, fighting digital fraud and money laundering, and maintaining security compliance. Join former executives from Bank of America, JP Morgan Chase, Silicon Valley Bank, and the Canadian Imperial Bank of Commerce as they discuss the benefits of analytics-driven risk management and automated security compliance. Heather Hinton, CTO for IBM Security and Compliance Architecture & Innovation, Sesh Murthy, Cloud Raxak CTO, and Raghuram Yeluri, Intel Security Architect, will discuss how to secure applications across the hybrid cloud through automated compliance. Automated security compliance can reduce cloud security costs up to 50% while also reducing the risk of a security breach. 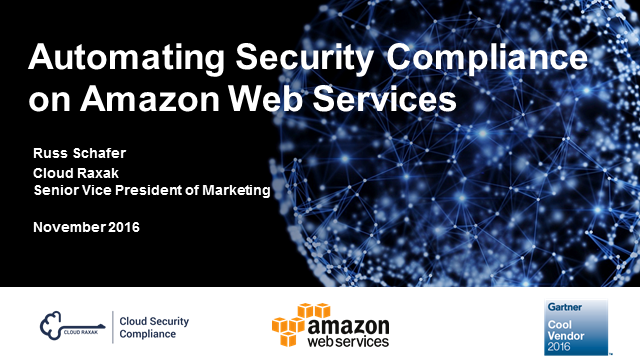 They will discuss the best ways to leverage cloud computing, while staying compliant with the security requirements of regulated industries including financial services, retail, healthcare, and more. The Hybrid cloud is being embraced by a majority of enterprises of all sizes. A recent survey shows that 74% of enterprises have a hybrid cloud strategy, and 94% of enterprises are using some form of XaaS--software, platform, and infrastructure as a service. The challenge in moving workloads to the Cloud, has been the cost and complexity of ensuring initial and ongoing security and regulatory (PCI, HIPAA, FFIEC) compliance across private and public clouds. Manual security compliance is slow, prone to human error, and represents over 50% of the cost of managing cloud applications. Determining how to automate cloud security compliance is critical to maintaining positive ROI. Raxak Protect is an automated security compliance SaaS platform and managed service, that enables cloud apps to be deployed securely, quickly, cost-effectively, and without human error, across both private and public clouds. 1. To secure IBM dedicated and shared hybrid cloud solutions using Raxak Protect automated compliance. 2. To deliver audit-ready evidence of security compliance for any workload including regulated workloads in finance (FFIEC), healthcare (HIPAA) and Retail (PCI). 3. Raxak Protect leverages hardware features like Intel Cloud Integrity Technology to create an immutable root of trust for assured compliance.